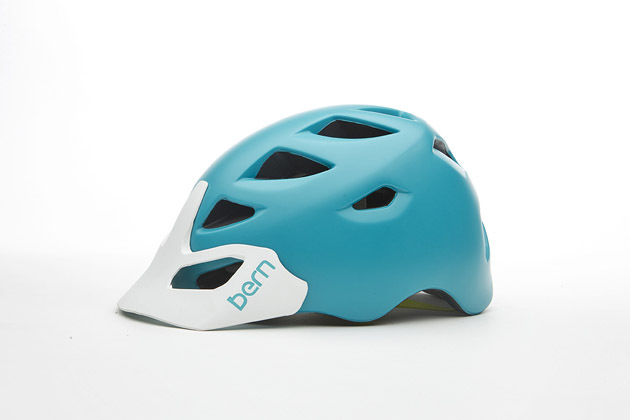 Pretty much everything Bern touches turns to cool so when I found out the lifestyle-inspired skate/snow brand was branching into women's mountain-bike helmets, I had to have a look. That initial look at the Interbike tradeshow two months ago turned into intrigue and when the Prescott showed up at the office last week, I was pretty excited to get this stylish half-shell out on the trail. While its bright dual-toned palette stands out on the Prescott, the colors are only a small part of what makes the helmet different from its male counterpart. It's molded from a smaller shell size, and has a higher cut in the back to allow for a ponytail. Indeed, a small, low-sitting ponytail did fit underneath the rear Boa dial, which tightens the helmet. Designers also used softer lines to create a low-profile lid that would appeal to a woman's fashion sense. The Prescott keeps its weight low–280 grams for size M/L–by using Bern's proprietary Zip Mold Plus foam, a thin liquid-injected polyurethane foam with a strong strength-to-weight ratio that sits under the PVC shell. I got my first taste of the Prescott on a three-hour ride with about 2,600 feet of climbing–so plenty of opportunity to sweat in the Southern Californian 'fall' weather–and my initial impressions were positive. It comes in two sizes, XS/S and M/L, and the M/L sample size felt a bit big for my pin-sized noggin so even with the Boa ratchet fully dialed, I still wanted it a bit tighter. On the trail, though, the helmet stayed put and felt comfortable all day. Like other 'enduro-style' lids, the extra coverage is excellent, but can put the squeeze on space for sunglasses, and if there was any point of discomfort for me, that would be it. At first glance, I worried that the inside of the helmet might turn into a sauna by mid-ride, but the 16 vents kept my head temperature regulated even on a couple of unforgiving climbs without any mercy from the breeze gods. Of course, this was merely a single ride–a more comprehensive review will require a lot more time in the saddle. Other features of the Prescott include a goggle clip and a removable visor. It also comes in a variety of color combinations, all unique compared to other women's helmets on the market. At $100, the mid-tier Prescott doesn't have all the features of a pricier lid like an integrated camera mount or an added protection layer like MIPS, but the weight, price and fit make for an all-around impressive package. And if its simple design and appealing colors attract more females to the sport, well then that's just a win all around. Both the Prescott and the Melrose urban women's helmet will be available next spring.